There has been a rapid deterioration in self-reported health in recent years with a doubling of the proportion of the population aged 16 years or over that were ‘mostly dissatisfied’ with their health since 2010. 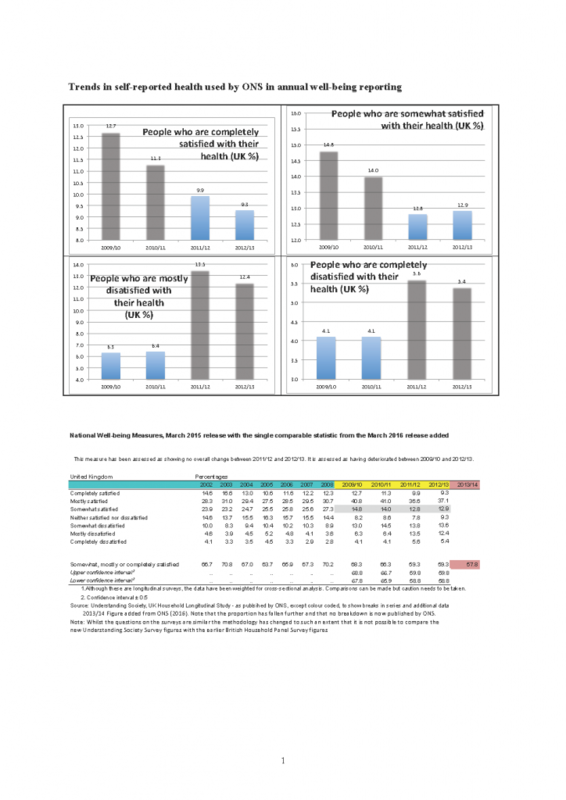 Self-reported health has continued to decline since the statistics used in this commentary were released in March 2015. Only one aggregate figure was released in early 2016. It combined three of the categories. Just one mention of this was made in the most recent 2016 Office for National Statistics (ONS) ‘measuring the quality of life’ report. The 2017 report has yet to be released. As the table below shows, the latest (2013–2014) statistic is worse than any recorded since 2002 and lies well outside the range of confidence limits last published by the ONS in their 2015 release (58.8–59.8%). Self-reported health in the UK is deteriorating at an alarming rate with acceleration in that deterioration in the year 2011. In “A Better Politics: How Government can make us happier” I used statistics collected by the British Household Panel Survey in the 1990s to show that health is overwhelmingly the most important short-term determinant of wellbeing. People can and do adapt to a deterioration in their health, but not when how they are having to live is making them, and especially those around them, ill.